All of our programs and services are designed to meet the needs of every individual experiencing homelessness; to comfort, encourage, and guide them back to self-sufficiency. If you or someone you know needs help, contact us at 218-326-2790. We serve everyone with compassion, dignity and respect. Grace House is a nonprofit organization that provides safe, temporary shelter for people who are experiencing homelessness. As Itasca County’s only homeless shelter, Grace House typically serves more than 200 individuals and children each year. Grace House guests may stay at the shelter for up to 30 days if needed to focus on developing life and job skills that enable them to become more self-sufficient in the community. The shelter is equipped with an on-site mini resources center where guests can access employment and housing opportunities. Private office spaces afford guests the opportunity to meet with Grace House’s trained staff and other professionals in a private, confidential setting. View our provided services here. As a non-profit organization, we rely heavily upon the monetary generosity of individuals, businesses and organizations. To find out how you can help, please click the button below. Since 2006, more than 200 individuals, families and children who are homeless or transient have been served by Grace House each year. Of the numerous homeless shelters in Minnesota, we are the only one serving Grand Rapids, MN and Itasca County. Grace House offers private sleeping quarters for individuals and families. 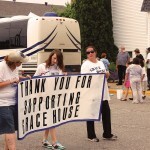 In June, more than 140 community volunteers took part in the United Way's Day of Action at Grace House. 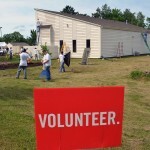 Volunteers painted the building during United Way's Day of Action at Grace House.